En el sitio del GEN (Global Editors Network) me encuentro con este artículo de Subhajit Banerjee sobre cómo la BBC y The Guardian cuentan historias en móviles. Le recomiendo ver en su móvil The Outline. Build for desktop then shrink down to mobile, or start with mobile and then scale up? 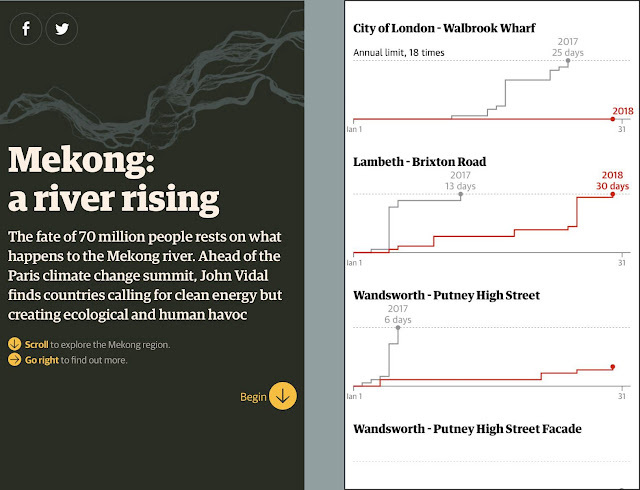 How do we make long articles and complex charts work for small screens and fat fingers instead of wide canvases and precise mouse clicks? These are some of the questions most media organisations grapple with on a daily basis. Two key global media giants who have been pioneering forces in delivering high quality, innovative journalism on mobile are the BBC and the Guardian. We talked to Bella Hurrell, deputy editor of BBC News Visual Journalism team and Feilding Cage, Visuals Editor of the Guardian, about how they make stories work on the small screen, their personal journeys, the key skills they focus on and their top tips. The BBC team is about 40 member strong, comprising designers (infographics, UX and video specialists), front end developers and journalists all focusing on output for the website. ‘We produce quick turnaround daily news graphics up to more interactive content including ‘personal relevance’ calculators and longer form storytelling’, explains Hurrell. The department is also home to all the BBC’s TV designers and picture editors which has been an added advantage for mobile. ‘We learned pretty early on that designing content for mobile and social media has a lot in common with designing for TV — graphics need to have a single focus, larger text and be visual to grab the attention of the distracted viewer’, offers Hurrell. The Guardian’s Visuals team has 30 members. The current avatar was created in late 2014 by merging the graphics and interactive teams with close collaboration with the data and photo teams. ‘A key component to our team is the mix of skills. We’re a team of about 20 with skills that include video, motion graphics, photography, graphic design, UX, data and coding, But most importantly, everyone on the team is a journalist’, says Cage. The team’s motto is ‘Explain the news when words aren’t enough’. ‘We produce visuals that are essential to understanding the news and that put the news in context. The Guardian’s newsroom is fairly digitally-savvy and so we spend a lot of time working with reporters on ideas already in motion. We’ve built chart and map tools to allow reporters outside of the team to produce some of the basics of visual journalism on their own’, Cage explains. The BBC team tries not to spend much longer than about eight weeks on any single project and collaborate on many of them with journalists and producers across the BBC. One of Hurrell’s favourites is What has President Trump said about your country? which she feels balances friendly design with interesting editorial content, has an accessible tone and provides great value as it is constantly updated with every new utterance of the US president. Then there are the calculators that follow a successful formula — explain a single idea in one sentence, allow basic inputs from the user to be entered in one mobile view, and then a reward in the form of personally relevant information. Some recent examples include the Tampon tax calculator that lets readers find out how much they have spent in value-added-tax on sanitary products in the UK, and the NHS tracker which shows the state of UK’s National Health Service by postcode. Love your user. Don’t make life hard for them by, for instance, by asking for information they don’t have to hand. They won’t go and look it up. For Cage, the real mobile change day to day has been approaching how the team plans and edits stories. ‘We now consider a lot more the X number of things we expect the reader to get out of this and then clearly structure the piece around it. That allows you to make decisions about design, data viz and technical optimisation that are clearly focused on mobile. Then, if it works on mobile it works on desktop with maybe some small enhancements’, Cage explains. 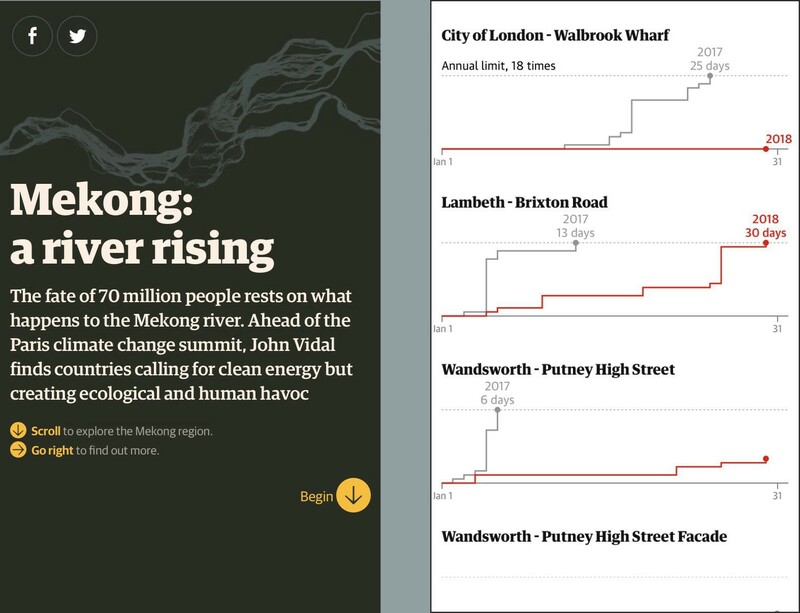 Recent examples include tracking live London pollution data to see which site breaks legal limits in 2018 first and the card-based Mekong river interactive that also helped devise new ways to tell stories and develop user interactions on mobile. Despite hiring some of the best editorial and technical people, the larger and older media organisations often struggle to change the mindset and habits of their staff and decision makers developed over the years. It wasn’t very different for the BBC and the Guardian when it came to mobile. ‘Even though the prevailing orthodoxy from the outset (when the BBC’s mobile audience began to grow significantly) was that it was better to come up with a mobile solution first and then design out into desktop, that was a really tricky shift for many journalists and editors who loved the big canvas provided by their desktop screens’, recalls Hurrell. 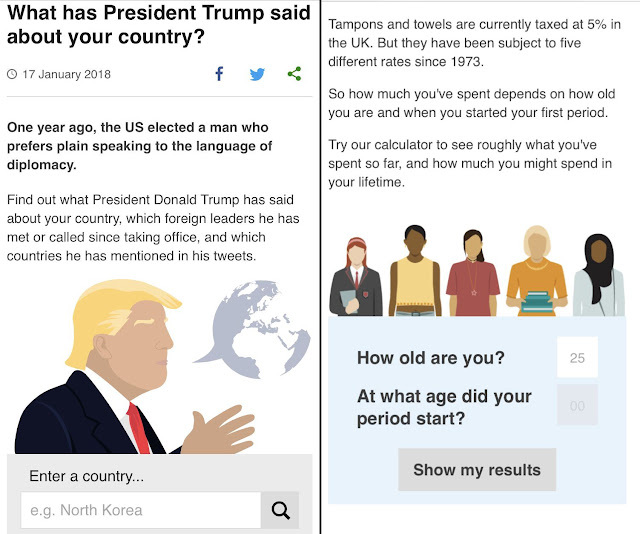 The most telling shift came in 2016 when the BBC’s product team changed the preview function of BBC News CMS — used by thousands of journalists to make online stories — to default to a mobile view. For Cage, a big focus this year is to shift from being reactive to proactive. ‘By the time a story appears on a newslist, it’s often too late as the publish time is within minutes to a few hours. We’ve built in time to think about the week ahead, and sometimes weeks ahead. It’s not that we need weeks to build a single project, but the extra time whilst juggling multiple projects allows us to report and develop our ideas just like any other piece of journalism’, he explains. The BBC and the Guardian may be news organisations that media companies around the world look up to for setting standards, but who do they envy and how do they see mobile storytelling shaping up in the rest of the industry? ‘Most news organisations have made big strides in terms of developing video that works best on mobile and social media. The Quartz app was an interesting move and since then some news organisations have been using conversational user interface-like explainers — refactored Q&A’s — to deliver context and background both on social media and within websites. I also think we will all get better at learning from audience data what really resonates with users and how to better structure stories. We can use them to create compelling content about sometimes harder-to-sell subjects like Yemen, Syria, climate change or Brexit’, offers Hurrell. Bella Hurrell is deputy editor of the multi award winning BBC News Visual Journalism team. She works creatively with designers, developers and journalists across BBC News to produce cross-platform stories and interactive digital content. She is currently focusing on innovative storytelling techniques for mobiles. Bella Hurrell hará una presentación en la cumbre del GEN de este año en Lisboa: When mobile takes all: four ideas you should implement by the end of 2018. Feilding Cage is the visuals editor at the Guardian, where he has worked since 2011. Before that, he worked as an interactive developer at the Associated Press. He studied Journalism and mass communication at the University of North Carolina at Chapel Hill and holds an MA in graphic communication technology & management from New York University.